These girls are all in quite different "states" at Miss Wayland's School. Laura E. Richards had a particularly warm spot for Maine, who loved winter snow storms the best and was the heroine who saved the day in this quaint story. The author raised her own family in Gardiner, Maine, so she knew a thing or two about blizzards! "Oh, dear! oh, dear! It's snowing!" Massachusetts looked up from her algebra. She was the head of the school. She was rosy and placid as the apple she was generally eating when not in class. Apples and algebra were the things she cared most about in school life. "Whence come these varying cries?" she said, taking her feet off the fender and trying to be interested, though her thoughts went on with "a 1/6 b =" etc. "Oh, Virginia is grumbling because it is snowing, and Maine is feeling happy over it, that's all!" said Rhode Island, the smallest girl in Miss Wayland's school. "Poor Virginia! It is rather hard on you to have snow in March, when you have just got your box of spring clothes from home." "It is atrocious!" said Virginia, a tall, graceful, languishing girl. "How could they send me to such a place, where it is winter all the spring? Why, at home the violets are in blossom, the trees are coming out, the birds singing--"
"And at home," broke in Maine, who was a tall girl, too, but lithe and breezy as a young willow, with flyaway hair and dancing brown eyes, "at home all is winter--white, beautiful, glorious winter, with ice two or three feet thick on the rivers, and great fields and fields of snow, all sparkling in the sun, and the sky a vast sapphire overhead, without a speck. Oh, the glory of it, the splendor of it! And here--here it is neither fish, flesh, fowl, nor good red herring. A wretched, makeshift season, which they call winter because they don't know what else to call it." "Come! come!" said Old New York, who was seventeen years old and had her own ideas of dignity. "Let us alone, you two outsiders! We are neither Eskimos nor Hindoos, it is true, but the Empire State would not change climates with either of you." "No, indeed!" chimed in Young New York, who always followed her leader in everything, from opinions down to hair-ribbons. "No, indeed!" repeated Virginia, with languid scorn. "Because you couldn't get any one to change with you, my dear." Young New York reddened. "You are so disagreeable, Virginia!" she said. "I am sure I am glad I don't have to live with you all the year round--"
"Personal remarks!" said Massachusetts, looking up calmly. "One cent, Young New York, for the missionary fund. Thank you! Let me give you each half an apple, and you will feel better." She solemnly divided a large red apple, and gave the halves to the two scowling girls, who took them, laughing in spite of themselves, and went their separate ways. "Why didn't you let them have it out, Massachusetts?" said Maine, laughing. "You never let any one have a good row." "Slang!" said Massachusetts, looking up again. "One cent for the missionary fund. You will clothe the heathen at this rate, Maine. That is the fourth cent to-day." "'Row' isn't slang!" protested Maine, feeling, however, for her pocket-book. "Vulgar colloquial!" returned Massachusetts, quietly. "And perhaps you would go away now, Maine, or else be quiet. Have you learned--"
"No, I haven't!" said Maine. "I will do it very soon, dear Saint Apple. I must look at the snow a little more." Maine went dancing off to her room, where she threw the window open and looked out with delight. The girl caught up a double handful and tossed it about, laughing for pure pleasure. Then she leaned out to feel the beating of the flakes on her face. "Really quite a respectable little snowstorm!" she said, nodding approval at the whirling white drift. "Go on, and you will be worth while, my dear." She went singing to her algebra, which she could not have done if it had not been snowing. The snow went on increasing from hour to hour. By noon the wind began to rise; before night it was blowing a furious gale. Furious blasts clutched at the windows, and rattled them like castanets. The wind howled and shrieked and moaned, till it seemed as if the air were filled with angry demons fighting to possess the square white house. Many of the pupils of Miss Wayland's school came to the tea-table with disturbed faces; but Massachusetts was as calm as usual, and Maine was jubilant. "Isn't it a glorious storm?" she cried, exultingly. "I didn't know there could be such a storm in this part of the country, Miss Wayland. Will you give me some milk, please?" "There is no milk, my dear," said Miss Wayland, who looked rather troubled. "The milkman has not come, and probably will not come to-night. There has never been such a storm here in my lifetime!" she added. "Do you have such storms at home, my dear?" "Oh, yes, indeed!" Maine said, cheerfully. "I don't know that we often have so much wind as this, but the snow is nothing out of the way. Why, on Palm Sunday last year our milkman dug through a drift twenty feet deep to get at his cows. He was the only milkman who ventured out, and he took me and the minister's wife to church in his little red pung. "We were the only women in church, I remember. Miss Betsy Follansbee, who had not missed going to church in fifteen years, started on foot, after climbing out of her bedroom window to the shed roof and sliding down. All her doors were blocked up, and she lived alone, so there was no one to dig her out. But she got stuck in a drift about half-way, and had to stay there till one of the neighbors came by and pulled her out." All the girls laughed at this, and even Miss Wayland smiled; but suddenly she looked grave again. "Hark!" she said, and listened. "Did you not hear something?" "We hear Boreas, Auster, Eurus, and Zephyrus," answered Old New York. "Nothing else." At that moment there was a lull in the screeching of the wind; all listened intently, and a faint sound was heard from without which was not that of the blast. "A child!" said Massachusetts, rising quickly. "It is a child's voice. I will go, Miss Wayland." "I cannot permit it, Alice!" cried Miss Wayland, in great distress. "I cannot allow you to think of it. You are just recovering from a severe cold, and I am responsible to your parents. What shall we do? It certainly sounds like a child crying out in the pitiless storm. Of course it may be a cat--"
Maine had gone to the window at the first alarm, and now turned with shining eyes. "It is a child!" she said, quietly. "I have no cold, Miss Wayland. I am going, of course." Passing by Massachusetts, who had started out of her usual calm and stood in some perplexity, she whispered, "If it were freezing, it wouldn't cry. I shall be in time. Get a ball of stout twine." She disappeared. In three minutes she returned, dressed in her blanket coat, reaching half-way below her knees, scarlet leggings and gaily wrought moccasins; on her head a fur cap, with a band of sea-otter fur projecting over her eyes. In her hand she held a pair of snow-shoes. She had had no opportunity to wear her snow-shoeing suit all winter, and she was quite delighted. "My child!" said Miss Wayland, faintly. "How can I let you go? My duty to your parents--what are those strange things, and what use are you going to make of them?" By way of answer Maine slipped her feet into the snow-shoes, and, with Massachusetts' aid, quickly fastened the thongs. "The twine!" she said. "Yes, that will do; plenty of it. Tie it to the door-handle, square knot, so! I'm all right, dear; don't worry." Like a flash the girl was gone out into the howling night. Miss Wayland wrung her hands and wept, and most of the girls wept with her. Virginia, who was curled up in a corner, really sick with fright, beckoned to Massachusetts. "Is there any chance of her coming back alive?" she asked, in a whisper. "I wish I had made up with her. But we may all die in this awful storm." "Nonsense!" said Massachusetts. "Try to have a little sense, Virginia! Maine is all right, and can take care of herself; and as for whimpering at the wind, when you have a good roof over your head, it is too absurd." For the first time since she came to school Massachusetts forgot the study hour, as did every one else; and in spite of her brave efforts at cheerful conversation, it was a sad and an anxious group that sat about the fire in the pleasant parlor. Maine went out quickly, and closed the door behind her; then stood still a moment, listening for the direction of the cry. She did not hear it at first, but presently it broke out--a piteous little wail, sounding louder now in the open air. The girl bent her head to listen. Where was the child? The voice came from the right, surely! She would make her way down to the road, and then she could tell better. Grasping the ball of twine firmly, she stepped forward, planting the broad snow-shoes lightly in the soft, dry snow. As she turned the corner of the house an icy blast caught her, as if with furious hands, shook her like a leaf, and flung her roughly against the wall. Her forehead struck the corner, and for a moment she was stunned; but the blood trickling down her face quickly brought her to herself. She set her teeth, folded her arms tightly, and stooping forward, measured her strength once more with that of the gale. This time it seemed as if she were cleaving a wall of ice, which opened only to close behind her. On she struggled, unrolling her twine as she went. The child's cry sounded louder, and she took fresh heart. Pausing, she clapped her hand to her mouth repeatedly, uttering a shrill, long call. It was the Indian whoop, which her father had taught her in their woodland rambles at home. The childish wail stopped; she repeated the cry louder and longer; then shouted, at the top of her lungs, "Hold on! Help is coming!" Again and again the wind buffeted her, and forced her backward a step or two; but she lowered her head, and wrapped her arms more tightly about her body, and plodded on. Once she fell, stumbling over a stump; twice she ran against a tree, for the white darkness was absolutely blinding, and she saw nothing, felt nothing but snow, snow. At last her snow-shoe struck something hard. She stretched out her hands--it was the stone wall. And now, as she crept along beside it, the child's wail broke out again close at hand. The girl's heart beat fast. "Where are you?" she cried. At the same moment she stumbled against something soft. A mound of snow, was it? No! for it moved. It moved and cried, and little hands clutched her dress. She saw nothing, but put her hands down, and touched a little cold face. She dragged the child out of the snow, which had almost covered it, and set it on its feet. "Who are you?" she asked, putting her face down close, while by vigorous patting and rubbing she tried to give life to the benumbed, cowering little figure, which staggered along helplessly, clutching her with half-frozen fingers. "Benny Withers!" sobbed the child. "Mother sent me for the clothes, but I can't get 'em!" "Benny Withers!" cried Maine. "Why, you live close by. Why didn't you go home, child?" "I can't!" cried the boy. "I can't see nothing. I tried to get to the school, an' I tried to get home, an' I can't get nowhere 'cept against this wall. Let me stay here now! I want to rest me a little." He would have sunk down again, but Maine caught him up in her strong, young arms. "Here, climb up on my back, Benny!" she said, cheerfully. "Hold on tight round my neck, and you shall rest while I take you home. So! That's a brave boy! Upsy, now! there you are! Now put your head on my shoulder--close! and hold on!" Ah! how Maine blessed the heavy little brother at home, who would ride on his sister's back, long after mamma said he was too big. How she blessed the carryings up and down stairs, the "horsey rides" through the garden and down the lane, which had made her shoulders strong! Benny Withers was eight years old, but he was small and slender, and no heavier than six-year-old Philip. No need of telling the child to hold on, once he was up out of the cruel snow bed. He clung desperately round the girl's neck, and pressed his head close against the woollen stuff. Maine pulled her ball of twine from her pocket--fortunately it was a large one, and the twine, though strong, was fine, so that there seemed to be no end to it--and once more lowered her head, and set her teeth, and moved forward, keeping close to the wall, in the direction of Mrs. Withers's cottage. For awhile she saw nothing, when she looked up under the fringe of otter fur, which, long and soft, kept the snow from blinding her; nothing but the white, whirling drift which beat with icy, stinging blows in her face. But at last her eyes caught a faint glimmer of light, and presently a brighter gleam showed her Mrs. Withers's gray cottage, now white like the rest of the world. Bursting open the cottage door, she almost threw the child into the arms of his mother. The woman, who had been weeping wildly, could hardly believe her eyes. She caught the little boy and smothered him with kisses, chafing his cold hands, and crying over him. "I didn't know!" she said. "I didn't know till he was gone. I told him at noon he was to go, never thinking 'twould be like this. I was sure he was lost and dead, but I couldn't leave my sick baby. Bless you, whoever you are, man or woman! But stay and get warm, and rest ye! You're never going out again in this awful storm!" In Miss Wayland's parlor the suspense was fast becoming unendurable. They had heard Maine's Indian whoop, and some of them, Miss Wayland herself among the number, thought it was a cry of distress; but Massachusetts rightly interpreted the call, and assured them that it was a call of encouragement to the bewildered child. Then came silence within the house, and a prolonged clamor--a sort of witches' chorus, with wailing and shrieking without. Once a heavy branch was torn from one of the great elms, and came thundering down on the roof. This proved the finishing touch for poor Virginia. She went into violent hysterics, and was carried off to bed by Miss Way land and Old New York. Massachusetts presently ventured to explore a little. She hastened through the hall to the front door, opened it a few inches, and put her hand on the twine which was fastened to the handle. What was her horror to find that it hung loose, swinging idly in the wind! Sick at heart, she shut the door, and pressing her hands over her eyes, tried to think. Maine must be lost in the howling storm! She must find her; but where and how? Oh! if Miss Wayland had only let her go at first! She was older; it would not have mattered so much. But now, quick! she would wrap herself warmly, and slip out without any one knowing. The girl was turning to fly up-stairs, when suddenly something fell heavily against the door outside. There was a fumbling for the handle; the next moment it flew open, and something white stumbled into the hall, shut the door, and sat down heavily on the floor. "Personal--rudeness!" gasped Maine, struggling for breath. "You shut the door in my face! One cent for the missionary fund." The great storm was over. The sun came up, and looked down on a strange, white world. No fences, no walls; only a smooth ridge where one of these had been. Trees which the day before had been quite tall now looked like dwarfs, spreading their broad arms not far from the snow carpet beneath them. Road there was none; all was smooth, save where some huge drift nodded its crest like a billow curling for its downward rush. Maine, spite of her scarred face, which showed as many patches as that of a court lady in King George's times, was jubilant. Tired! not a bit of it! A little stiff, just enough to need "limbering out," as they said at home. "There is no butter!" she announced at breakfast. "There is no milk, no meat for dinner. Therefore, I go a-snow-shoeing. Dear Miss Wayland, let me go! I have learned my algebra, and I shall be discovering unknown quantities at every step, which will be just as instructive." Miss Wayland could refuse nothing to the heroine of last night's adventure. Behold Maine, therefore, triumphant, sallying forth, clad once more in her blanket suit, and dragging her sled behind her. There was no struggling now--no hand-to-hand wrestling with storm-demons. The sun laughed from a sky as blue and deep as her own sky of Maine, and the girl laughed with him as she walked along, the powdery snow flying in a cloud from her snow-shoes at every step. Such a sight had never been seen in Mentor village before. The people came running to their upper windows--their lower ones were for the most part buried in snow--and stared with all their eyes at the strange apparition. In the street, life was beginning to stir. People had found, somewhat to their own surprise, that they were alive and well after the blizzard; and knots of men were clustered here and there, discussing the storm, while some were already at work tunnelling through the drifts. Mr. Perkins, the butcher, had just got his door open, and great was his amazement when Maine hailed him from the top of a great drift, and demanded a quarter of mutton with some soup meat. "Yes, miss!" he stammered, open-mouthed with astonishment. "I--I've got the meat; but I wasn't--my team isn't out this morning. I don't know about sending it." "I have a 'team' here!" said Maine, quietly, pulling her sled alongside. "Give me the mutton, Mr. Perkins; you may charge it to Miss Wayland, please, and I will take it home." "Young woman! I will give you ten dollars for the use of those snow-shoes for an hour!" Maine looked up in amazement, and laughed merrily when she saw the well-known countenance of the village doctor. "What! You, my dear young lady?" cried the good man. "This is 'Maine to the Rescue,' indeed! I might have known it was you. But I repeat my offer. Make it anything you please, only let me have the snow-shoes. I cannot get a horse out, and have two patients dangerously ill. What is your price for the magic shoes?" "My price, doctor?" repeated Maine, looking up with dancing eyes. "My price is--one cent. For the Missionary Fund! 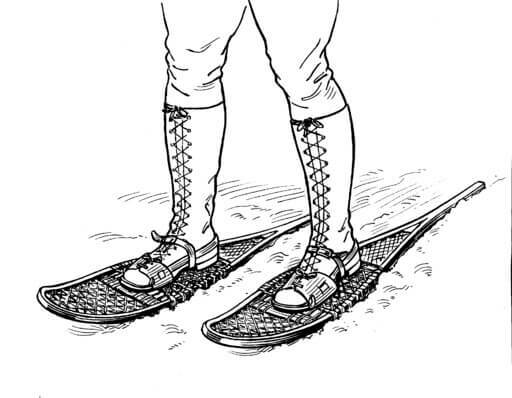 The snow-shoes are yours, and I will get home somehow with my sled and the mutton." So she did, and Doctor Fowler made his calls with the snow-shoes, and saved a life, and brought cheer and comfort to many. But it was ten dollars, and not one cent, which he gave to the Missionary Fund. If you enjoyed Ms. Richard's' story, you may also like The Shed Chamber. Add Maine to the Rescue to your own personal library.